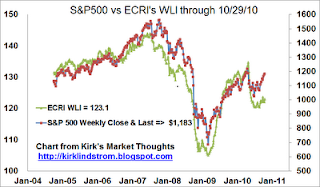 WLI is 123.1, up from the prior week's revised reading of 122.0. 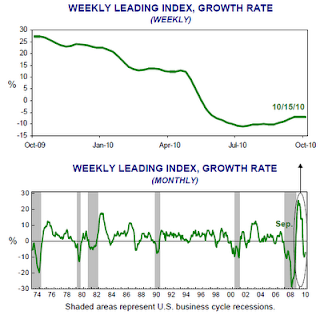 Since apparently bottoming at -10.3 for the week of August 27, WLI growth moved higher or was flat for the eighth consecutive week to minus 6.5% from minus 6.9% a week ago. 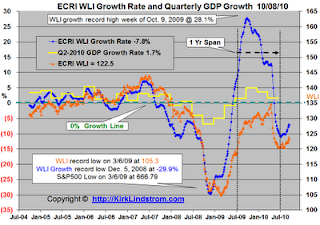 Yesterday ECRI said "The much-feared double-dip recession is not going to happen. That is the message from leading business cycle indicators, which are unmistakably veering away from the recession track, following the patterns seen in post-World War II slowdowns that didn't lead to recession.After completing an exhaustive review of key drivers of the business cycle, ranging from credit to inventories and measures of labor market conditions, we can forecast with confidence that the economy will avoid a double dip. Note my chart for today shows the first estimate of Q3 GDP growth of 2.0%. Q2 GDP was unchanged at 1.7%. Once again, ECRI scores a direct hit with WLI and WLI growth stabilizing before it was announced GDP was stable. The WLI for the week ending 10/29/10 will be released on 11/5/10. "The much-feared double-dip recession is not going to happen." "That is the message from leading business cycle indicators, which are unmistakably veering away from the recession track, following the patterns seen in post-World War II slowdowns that didn't lead to recession." After completing an exhaustive review of key drivers of the business cycle, ranging from credit to inventories and measures of labor market conditions, we can forecast with confidence that the economy will avoid a double dip. But the bad news is that a revival in economic growth is not yet in sight. The slowing of economic growth that began in mid-2010 will continue through early 2011. Thus, private sector job growth, which is already easing, will slow further, keeping the double-dip debate alive. Even worse, the Fed could be behind the curve yet again with QE2 leading to unintended inflation down the road. The problem with QE2. The worse news is that, even without the nightmare of a new recession, an uglier scenario may still lie ahead in the form of unintended consequences of such Fed stimulus. ECRI warns that the Fed, using its rear-view mirror indicators, may be goosing the economy with an inflationary stimulus program when it isn't needed and worse, just before the economy could get better. Because monetary policy acts with "long and variable lags," the Fed should, in principle, rely on forward-looking measures to time its actions. Yet, in practice, it does pretty much the opposite, relying on backward-looking statistics like core inflation and hard-to-assess measures of the so-called output gap, including estimates of "full employment." In mid-2003, the last time "core" inflation was this low, the Fed cut rates to just 1% and kept it there for a year, contributing in no small measure to the inflation of the housing bubble that ended so disastrously. In fact, the Fed is about to launch QE2 because it believes inflation to be too low, which really means they are willing to go to new extremes to head off the risk of deflation. Yet, over the last two centuries the U.S. economy has seen sustained deflation only when it has mostly been in recession -- a scenario that our analysis rules out for now. If the Fed goes ahead with its planned QE2 program, then the question for us investors will be "where is the next bubble forming?" Today, the car that is the U.S. economy is crawling uphill, slowing as its engine sputters. With politicians fighting about whether to use a screwdriver or a spanner wrench to fix the motor, the Fed is convinced we'll end up using neither. Determined not to let the car start rolling back disastrously downhill, yet unaware that the road is about to level off, the Fed is strapping an untested rocket onto the car in hopes of blasting it over the top. The Fed, looking out the rear-view mirror to steer the car, won't know when we're approaching a bend in the road, though we're now high up in the mountains, with a dangerous abyss below. If the Fed goes ahead with its planned QE2 program, then the question for us investors will likely be "where is the next bubble forming?" The very high returns for my individual TIPS and TIPS funds (FINPX Charts and VIPSX Charts) these past two years plus the large gains in gold (Gold Charts and Quote) and commodities, despite low CPI inflation, might be signaling what lies ahead. 21 Sept 2010: Key excerpts from the article on iSuppli's web site titled "Amid Softening Demand and Rising Inventory, iSuppli Trims 2010 Chip Forecast"
iSuppli now expects that revenue in the fourth quarter will decline by 0.3 percent compared to the third quarter, the first sequential decrease since the market collapse in the fourth quarter of 2008 and first quarter of 2009. With consumer demand slowing and inventories rising, the market research ﬁrm iSuppli Corp. is trimming its 2010 semiconductor revenue forecast to 32 percent, down from its previous outlook of 35.1 percent. In terms of specific semiconductor products, the hottest items in 2010 will be DRAM, voltage regulators, LEDs, Programmable Logic Devices (PLDs) and data converters. 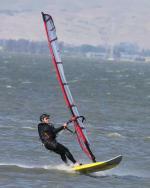 Revenue for each of these products is projected to grow by more than 43 percent in 2010. DRAM will lead the group with 87 percent growth on the strength of the soaring PC market. ... based on its most recent analysis of the electronics supply chain, iSuppli expects the chip business to experience a soft landing in 2011 and not to suffer the kind of dramatic downturn seen in 2009. Global semiconductor revenue in 2011 will rise by 5.1 percent, iSuppli predicts. WLI is 122.1, down from the prior week's reading of 122.2. 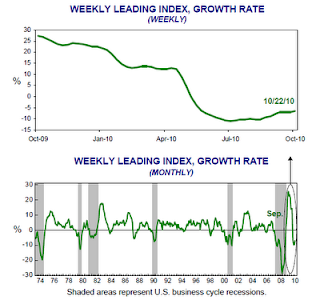 Since apparently bottoming at -10.3 for the week of August 27, WLI growth moved higher or was flat for the seventh consecutive week to minus 6.8% from minus 7.0% a week ago. Four weeks ago with both the WLI and its growth rate lower, Lakshman Achuthan, managing director at ECRI said, "After a brief plunge in the late spring, the WLI has been fairly stable throughout the summer and into September, suggesting that it is still premature to predict a new recession." The WLI for the week ending 10/22/10 will be released on 10/29/10. There will be no fizz in Social Security checks for the new year. The Social Security Administration announced "There will be no increase in Social Security benefits payable in January 2011, nor will there be an increase in SSI payments." The last year in which a COLA became effective was 2008. Therefore the law requires that we use the average CPI-W for the third quarter of 2008 as the base from which we measure the increase (if any) in the average CPI-W. The base average is 215.495, as shown in the table below. Also shown in the table below, the average CPI-W for the third quarter of 2010 is 214.136. Because there is no increase in the CPI-W from the third quarter of 2008 through the third quarter of 2010, there is no COLA for December 2010. Remember that the price of oil peaked during the three months in 2008 when the COLA for 2009 was set at 5.8%. 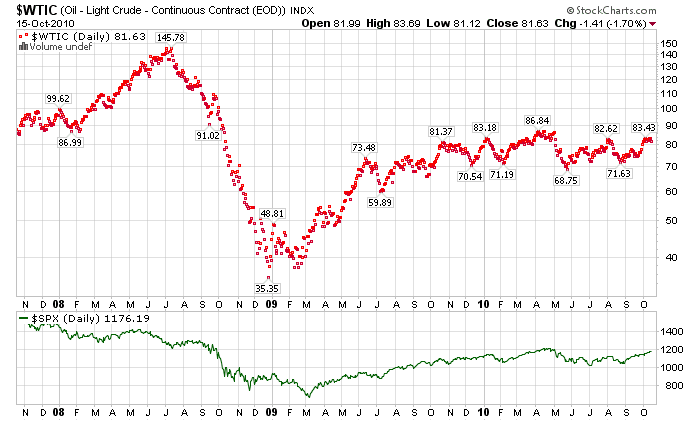 Chart showing oil prices vs the S&P500. With oil prices the past three months about half their peak value, CPI is slowly catching up but still below the 2008 calculation. The good news for seniors is they benefited from a higher SS payment than they would have received if the 2009 COLA was set a few months later after the price of oil crashed to $35 at the end of 2008. 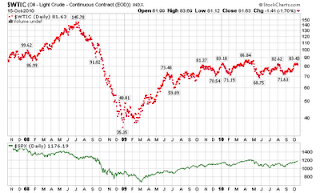 Here is a chart and current quote for crude oil prices. Since this blow-up of CPI in 2008 due to high oil prices, I've reported CPI by month in my newsletter in a table so you can see what to expect. CPI peaked in July 2008 at 219.964. I show this value in Red. This September the CPI recovered to 218.439, still slightly below its 2008 peak. CPI for 2008 was only up 0.1% but Social Security beneficiaries got a 5.8% adjustment because of the spike in oil prices. They were very, very lucky to get a 5.8% raise while the rest of the country got fewer hours or lost jobs during the recession. This table Automatic Social Security Cost-Of-Living Adjustments by Year clearly shows the January 2009 adjustment of 5.8% was the largest since July 1982! Since actual CPI was effectively lower than what Social Security recipients were getting paid for, taxpayers were very generous to retired people at a very good time... during this recession. My guess is the CPI will make a new high in the next few months and COLAs will show up again next year for 2012. Click for a chart and current quote for crude oil prices. WLI is 122.4, down from the prior week's reading of 123.7. 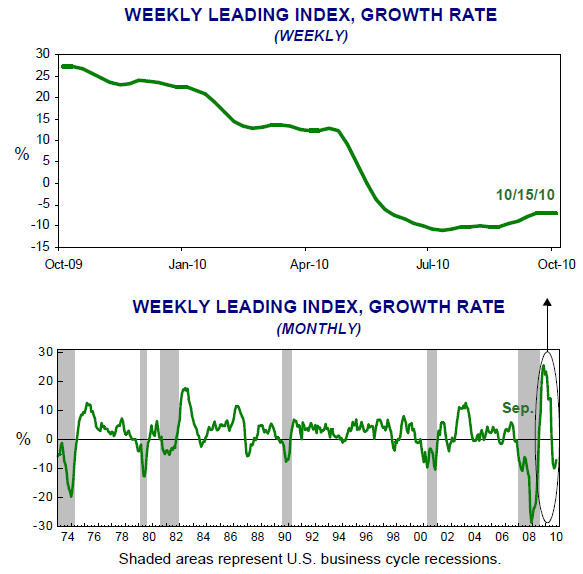 Since apparently bottoming at -10.3 for the week of August 27, WLI growth moved higher for the sixth consecutive week to minus 6.9% from minus 7.0% a week ago. 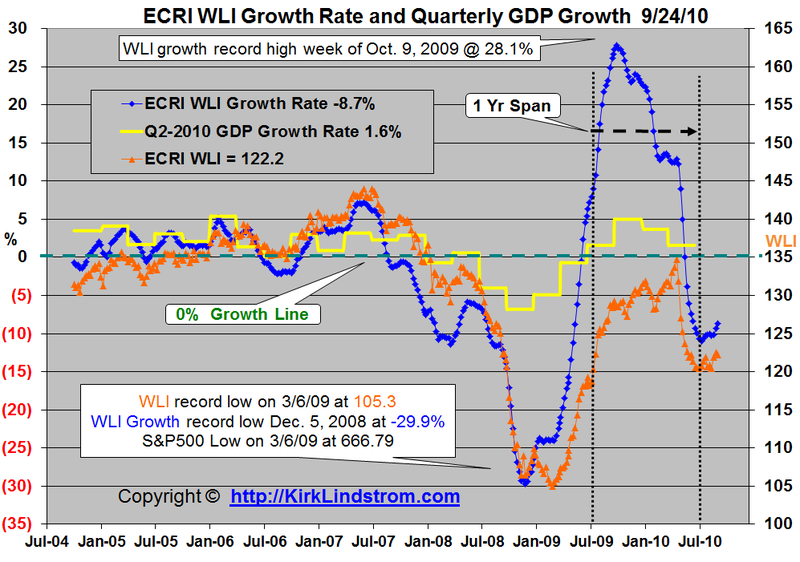 Three weeks ago with both the WLI and its growth rate lower, Lakshman Achuthan, managing director at ECRI said, "After a brief plunge in the late spring, the WLI has been fairly stable throughout the summer and into September, suggesting that it is still premature to predict a new recession." The WLI for the week ending 10/15/10 will be released on 10/22/10. MOUNTAIN VIEW, Calif. – October 14, 2010 - Google Inc. (NASDAQ: GOOG) today announced financial results for the quarter ended September 30, 2010. "Google had an excellent quarter," said Eric Schmidt, CEO of Google. "Our core business grew very well, and our newer businesses -- particularly display and mobile -- continued to show significant momentum. Going forward, we remain committed to aggressive investment in both our people and our products as we pursue an innovation agenda." Google Sites Revenues - Google-owned sites generated revenues of $4.83 billion, or 67% of total revenues, in the third quarter of 2010. This represents a 22% increase over third quarter 2009 revenues of $3.96 billion. Google Network Revenues - Google’s partner sites generated revenues, through AdSense programs, of $2.20 billion, or 30% of total revenues, in the third quarter of 2010. This represents a 22% increase from third quarter 2009 network revenues of $1.80 billion. International Revenues - Revenues from outside of the United States totaled $3.77 billion, representing 52% of total revenues in the third quarter of 2010, compared to 52% in the second quarter of 2010 and 53% in the third quarter of 2009. Excluding gains related to our foreign exchange risk management program, had foreign exchange rates remained constant from the second quarter of 2010 through the third quarter of 2010, our revenues in the third quarter of 2010 would have been $9 million lower. Excluding gains related to our foreign exchange risk management program, had foreign exchange rates remained constant from the third quarter of 2009 through the third quarter of 2010, our revenues in the third quarter of 2010 would have been $169 million higher. TAC - Traffic Acquisition Costs, the portion of revenues shared with Google’s partners, increased to $1.81 billion in the third quarter of 2010, compared to TAC of $1.56 billion in the third quarter of 2009. TAC as a percentage of advertising revenues was 26% in the third quarter of 2010, compared to 27% in the third quarter of 2009. Other Cost of Revenues - Other cost of revenues, which is comprised primarily of data center operational expenses, amortization of intangible assets, content acquisition costs as well as credit card processing charges, increased to $747 million, or 10% of revenues, in the third quarter of 2010, compared to $667 million, or 11% of revenues, in the third quarter of 2009. Operating Expenses - Operating expenses, other than cost of revenues, were $2.19 billion in the third quarter of 2010, or 30% of revenues, compared to $1.64 billion in the third quarter of 2009, or 28% of revenues. Operating Income - GAAP operating income in the third quarter of 2010 was $2.55 billion, or 35% of revenues. This compares to GAAP operating income of $2.07 billion, or 35% of revenues, in the third quarter of 2009. Non-GAAP operating income in the third quarter of 2010 was $2.93 billion, or 40% of revenues. This compares to non-GAAP operating income of $2.39 billion, or 40% of revenues, in the third quarter of 2009. 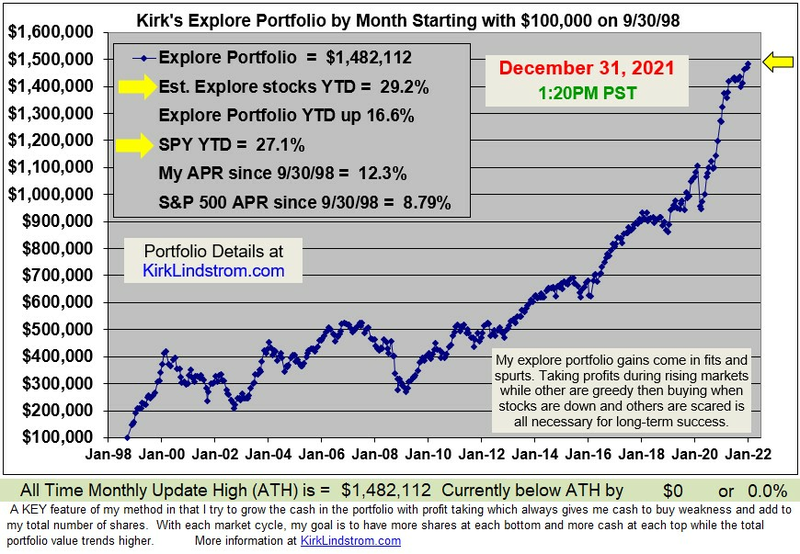 Disclosure: Long Google in my personal account and in the "Explore Portfolio" in "Kirk Lindstrom's Investment Letter" at a $310 entry price. Today Maria Bartiromo interviewed George Soros on CNBC's "Closing Bell." Soros said he expects the global economic slowdown to continue into 2011 and we need more fiscal stimulus to avoid a second recession. He also thinks extending the Bush tax cuts to the wealthy is a mistake. Summary of his Key comments. The recession has been shorter and shallower than it would have been had the countries not worked together to provide economic stimulus. We are in danger of a second slowdown unless we get more fiscal stimulus which political debate is making near impossible. Extending the Bush tax cuts for the top two percent is a bad idea because in the long term "we need a prosperous economy." Short term, it would help him but he believes in the long term it is the wrong thing to do since we need to pay for fiscal stimulus. Extending Bush tax cuts to the middle class, those making under $250,000, is the "right thing to do." Governments need to prevent a "currency war." China has to move on its current currency position. Says China's capital controls allows it to control their currency and others. So China is now the dominant factor in how other currencies move so they can put pressure on Japan but Japan can not buy currency of China which makes it unfair. The developed markets and China are slowing down. Soros says it is "tragic" that the Republicans want to satisfy their contributors who want a tax cut rather than the general good of the public. He seems amazed "they managed to get the whole public to buy into it." "I follow Greece very closely." He says Greece is succeeding with very harsh steps. "The Euro is here to stay." Says a rescue mechanism, that they now have, was the missing ingredient. Subscribe NOW and get the October 2010 Issue of "Kirk Lindstrom's Investment Letter" for FREE! WLI is 123.8, up from the prior week's reading of 122.5. 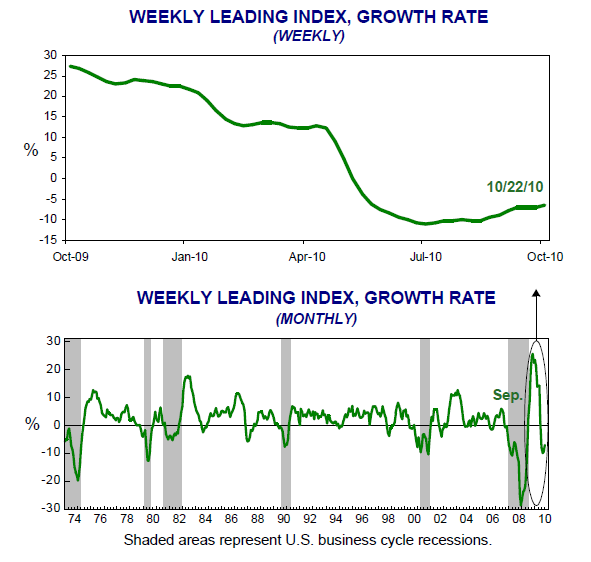 Since apparently bottoming at -10.3 for the week of August 27, WLI growth moved higher for the fifth consecutive week to minus 7.0% from minus 7.8% a week ago. Two weeks ago with both the WLI and its growth rate lower, Lakshman Achuthan, managing director at ECRI said, "After a brief plunge in the late spring, the WLI has been fairly stable throughout the summer and into September, suggesting that it is still premature to predict a new recession." The WLI for the week ending 10/1/10 will be released on 10/15/10. Vanguard Lowered Admiral Shares Minimum to $10,000 for Index Funds and $50,000 for Managed Funds. "If any of your current Vanguard fund holdings qualify, we'll notify you by mail and provide additional details about what this change means for you. Then, over the next few weeks, we'll complete the change for you automatically." I called Vanguard and immediately converted my accounts that were under $100,000 and qualified to the lower cost funds. The gentleman I spoke to was not aware of the change and thanked me for alerting him. They said they plan to convert accounts automatically but you can call or do it yourself online. Effective today, Vanguard has reduced the minimum amount required to qualify for Admiral™ Shares to $10,000 for most of our broad-market index funds and $50,000 for actively managed funds, down from the previous $100,000 minimum. Admiral Shares cost significantly less than traditional fund shares, and their expense ratios are among the lowest in the mutual fund marketplace. Thanks to their low costs, Admiral Shares can reduce your expenses 18%–50% below the already low expense ratios of our standard Investor Shares. For example, if you invest $50,000 in a fund's Admiral Shares with a 0.07% expense ratio instead of its Investor Shares with a 0.18% expense ratio, you could keep approximately $1,200 more in net returns for your account over a 10-year period, assuming an average annual return of 8%. When you're promoted to Admiral Shares, you'll remain invested in the same Vanguard fund(s). Admiral Shares are just lower-expense shares of existing funds. All cost-basis information from your Investor Shares will be transferred to your Admiral Shares automatically. Changes from Investor Shares to Admiral Shares of the same fund are tax-free. Any check writing privileges you had with your Investor Shares account will transfer to your Admiral Shares account. You'll receive a new checkbook for your Admiral Shares account. My core portfolios are made of Vanguard index funds and a CD. This great news means all funds become Admiral shares where they get the lower expense ratios to keep even more money in my portfolios! My "50:50 Conservative Core Portfolio" was up 75.3% or 4.9% compound annual return. My "80:20 Aggressive Core Portfolio" was up 62.2% or 4.2% compound annual return. My "70:30 Explore Portfolio" was up 170.2% or 8.8% compound annual return. 80% in “Core Aggressive” plus 20% in “Explore” was up 88.1% or 5.5% compound annual return. 95% “Core Conservative” plus 5% “Explore” was up 82.8% or 5.3% compound annual return. 100% in VTSMX was up 27.5% or 2.1% compound annual return. VFINX (S&P500) was up 14.4% or 1.1% compound annual return. Vanguard's Money Market Fund was up 41.4% or 3.0% compound annual return. 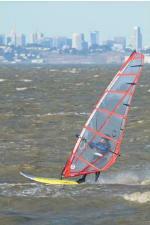 Subscribe NOW and get the October 2010 Issue for FREE! WLI is 122.5, up from the prior week's reading of 122.2. WLI growth moved higher to minus 7.8% from minus 8.7% a week ago. Last week with both the WLI and its growth rate lower, Lakshman Achuthan, managing director at ECRI said, "After a brief plunge in the late spring, the WLI has been fairly stable throughout the summer and into September, suggesting that it is still premature to predict a new recession." The WLI for the week ending 10/1/10 will be released on 10/8/10.